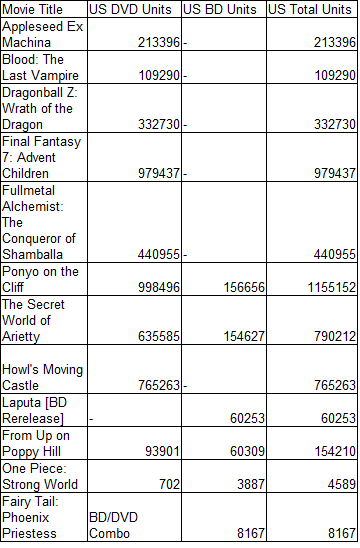 The One Piece/Fairy Tail movie numbers may or may not be reflective of what the shows regularly put up. I have a couple volumes’ worth of data for each, and plan on estimating what their long-term sales are after I get additional confirmation of the amazon model I’m currently using. It does seem, based on a cursory glance at the current rankings of March/April releases, like US releases have fairly long tails. This entry was posted in Articles, Fun With Numbers and tagged Anime, Fairy Tail, Fun With Numbers, One Piece by torisunanohokori. Bookmark the permalink.